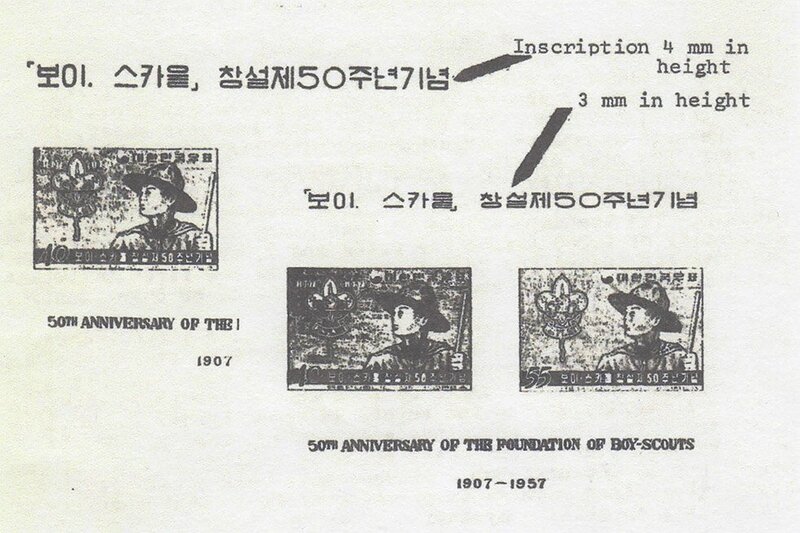 Korean Philately (KP) had a very interesting article about two souvenir sheets in the 1974 Volume 3 issue about the 1957 Boy Scout and the 1958 Second Postal Week sheets. 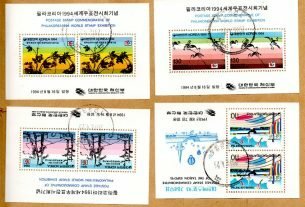 Each of these sheets has a variety that is very rare and these varieties are missing in most of the Korean collections. 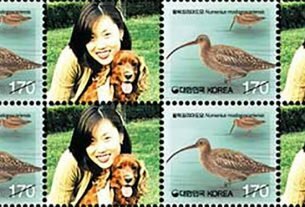 This author would like to know if anyone has either of the two in their collection and could share a scan of them with the Korean Stamp Society (KSS). Figures 1 and 2 are scans of the normal issued souvenir sheets, see Figure 3 for the article in KP. 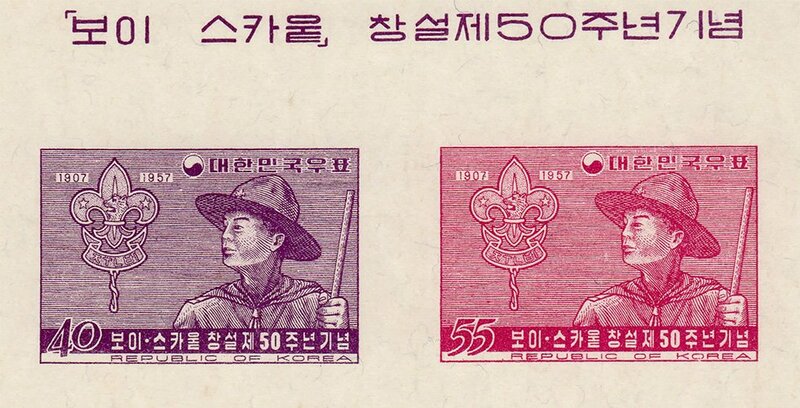 As the article states, the Boy Scout souvenir sheet’s usual inscription is 4 mm in height; there is a variety where the inscription is smaller and only 3 mm in height. The Scott numbers for the Boy Scout issue is 245-6, but they do not list this souvenir sheet, as they consider it a presentation sheet. 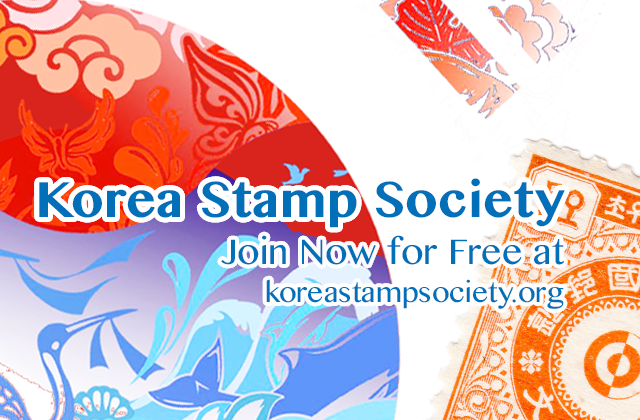 The 2019 Korean Postage Stamp Catalogue (KPSC) does list the Boy Scout souvenir sheet as 179-80a. 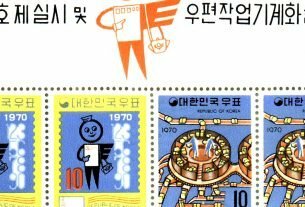 The normal sheet is quite rare by itself, but can be found, even on eBay, and it is valued by the KPSC at 4,500,000 won ($4000). 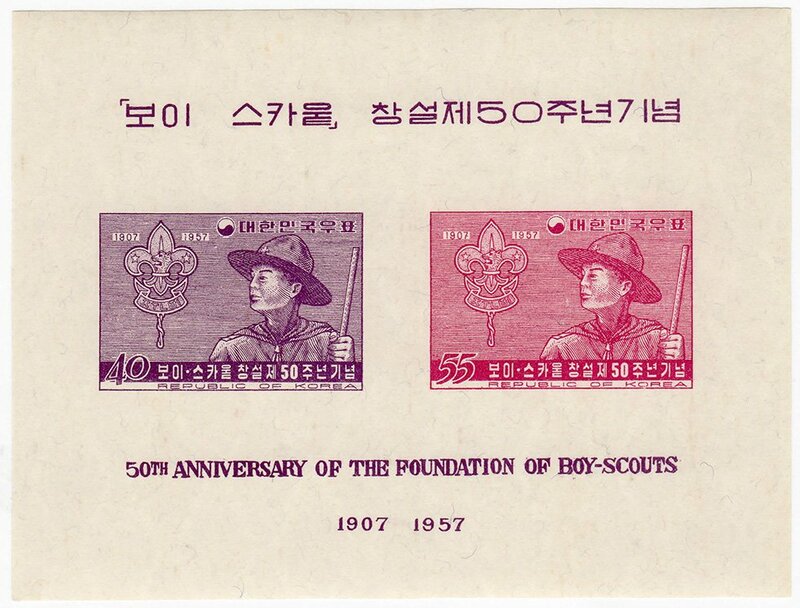 It is a very popular souvenir sheet, as there are demands for obtaining one by topical collectors for Boy Scout issues, as well as by the Korean collector. 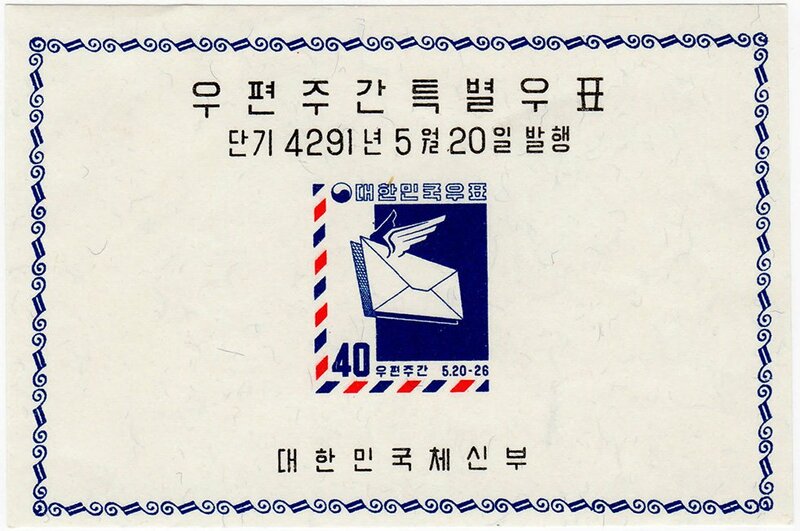 The KPSC lists the smaller inscription as 179-80b and values it at 6,000,000 won ($5400). This author has never seen one of the smaller inscriptions for sale nor listed in an auction. The Second Postal Issue exists with the top margin description missing. Scott does list the normal souvenir sheet of this issue as 283a; it is quite scarce in its own right, and Scott values it at $2000 in italics. Scott does not mention the variety that has the missing the top margin description. 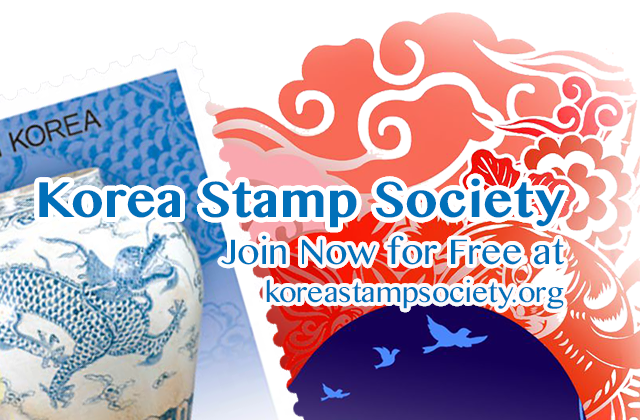 The KPSC lists the normal souvenir sheet as 191a and values it at 3,200,000 won ($2900). 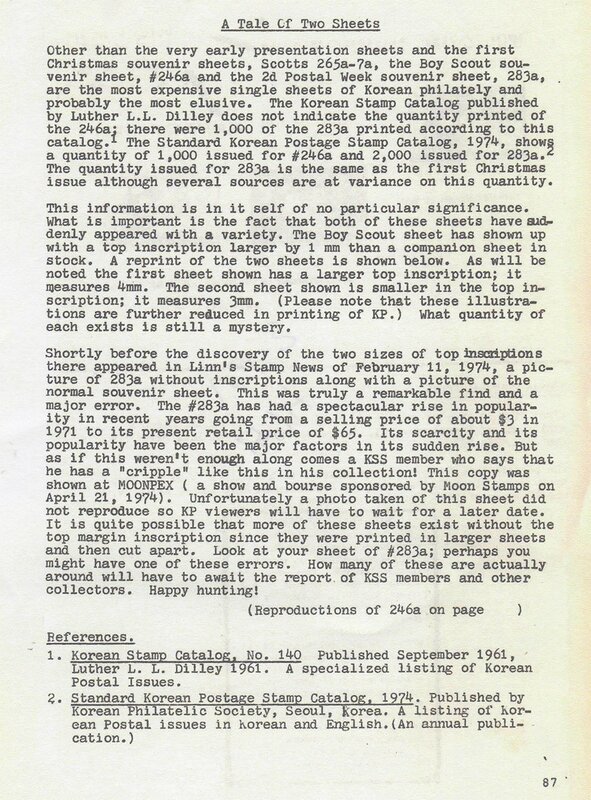 The KPSC also lists the souvenir sheet without the top margin description as 191b and it is valued at 8,000,000 won ($7200). The author has also never seen one without the top margin description, nor listed neither for sale, nor in an auction. Figure 3: KP Vol. XXIII No. 3 page 87 article titled “A tale of two sheets”. Figure 4: from same article. So, if anyone has information and/or photos of these rare varieties, please share with them with the KSS.